Fluorescence Filters: all narrow pass Dapi, CFP, FITC, YFP, Rhodamine, CY5. Others available from a large library on request. This is a checklist when beginning your session and when ending your session. and should be in this state when you arrive. 10X phase contrast; 20X phase contrast; a 40X of some type, 60X oil phase contrast. DAPI longpass; FITC narrow; Cy3 narrow; Cy5. Alternative turret in drawer with CFP and YFP and user configured filters. N.A. 0.30 condenser in drawer. Remove objective heater collar from microscope. Remove all dishes of cells. Remove all microinjection materials (capillaries and pipette tips). The first piece of equipment to go on (if needed) before any of the power strips is the Hg lamp. As shown in this picture, it is off. Simply turn the power switch on and wait up to a full minute for the lamp to come on. Shutters and camera This one power switch is supposed to turn on the camera and the automated shutters. However, people sometimes incorrectly turn off the individual components so you may want to check they are turned on properly before running the software. 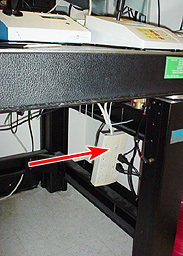 This one power switch turns on and off the microinjection system. Other accessories needed ONLY when the microinjection apparatus is on may be plugged in here. Computer power switch is on the front of the box. The computer is usually on. Check that the computer isn't in standby mode by checking that the monitor is turned on and by moving the mouse or tapping the <shift> key before pressing the power switch. 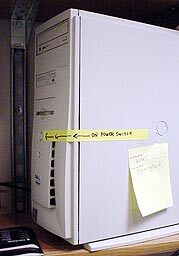 If the computer really is off, press the on/off button. The heated stage will lie flat in only one orientation. The line on the edge of the stage must be within the narrow range shown. THE BIOPTECHS OBJECTIVE HEATER INSTRUCTIONS ARE ON A DIFFERENT WEB PAGE. Choose a default folder to save your files. Save all files in the User Files folder. Files found anywhere else on the computer will be deleted without warning. Press F1 to open the fluorescence shutter. Focus the specimen with the coarse and fine adjustment knobs. Press F2 to open the transmitted light shutter. 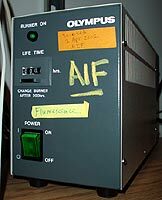 Make sure that the diffusion filter and the IF550 filter (green interference filter) are in the light path. Choose the appropriate phase setting on the condenser. Turn the beam splitter, knob on the right side of the microscope, to eye/SP. This sends 80% of light to the camera and allows for viewing through the eyepieces. Press F4 for a live preview of the sample. If necessary, refocus the sample while looking at the image on the monitor. This will be the final image. Close the luminous field diaphragm completely. Look into the eyepieces and focus the (edges) diaphragm image by raising or lowering the condenser with the height adjustment knob on either side of the condenser. Center the diaphragm image with the two large, silver screws at the front of the condenser. Open the luminous field diaphragm until it is at the edge of the field of view. Place the cursor over a bright area on the image. Note the number at the bottom left of the image window. This is the intensity value of the pixel the cursor points to. Adjust the exposure time so that this value is within 3000 - 4000. This exposure time is for an image of a binning of 2X2. *Shutter remains open during image capture. Press F1/F2 to close the shutter after the image is collected. * Note: To collect a 1X1 bin image, multiply calibrated exposure time (ms) from above by 4. Enter this exposure time and binning. The brightest spot in the final image should have a maximum number in box at bottom left of the window between 30,000 - 60,000 . If it is smaller than this, image manipulation will be hampered. Transfer all files to CD, Zip, flash memory key or to your own computer over the network. All switches on the black box must be down. 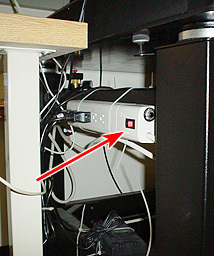 Turn off camera and switches with the one switch on the power strip to the left of the table. DO NOT turn off the camera and shutters box with their own switches. If you used microinjection, turn off with the one power strip under the table. DO NOT turn off the microinjection with the switches on the backs of the boxes. There is no need to ever move the microinjection boxes. 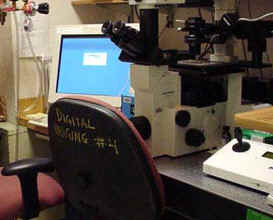 Turn off halogen/transmitted light on microscope with switch at back right. If used, remove heating collar from objective and heated stage. Microscope must be left with a normal stage on it. See Standard Configuration above for checklist of how things should be. Leave mercury lamp on for next user unless you are absolutely positive you are the last user of the day. Confirm you signed in and out of log book. Function keys have been programmed to execute commands with a single keystroke. For instance, if you strike the [Shift]F1 keys, you will be prompted to input an exposure time in milliseconds and a binning size for the CCD camera. Then clicking OK or striking <Enter> will take a picture. People have been reporting that function keys do not work as advertised. If you find any problems with function keys, either you are running the wrong version of IPLab or there really is something wrong with the function key script. Make an appt. with me on the machine to fix this. Ghosh M, Song X, Mouneimne G, Sidani M, Lawrence DS, Condeelis JS. (2004) Cofilin promotes actin polymerization and defines the direction of cell motility. Science. 304(5671):743-6.